On a wonderful Autumnal Saturday afternoon here at the CorpAcq Stadium, it was the turn of the second team to entertain Preston Grasshoppers in the Cotton Traders Premier League. With the home side having started the season with a mixed bag of results, they were looking to get back to winning ways against a youthful Hoppers side who had only won one of their last four games this season. It was they who opened the scoring early on, with just two minutes on the clock when Sale were adjudged to have left their feet at the ruck. Hoppers decided to go for goal on this occasion with the impressive No.9 Jobe Roxby taking the three points on offer giving Hoppers the early lead in the match. However, this lead was only to last for another five minutes before some excellent interplay between the forwards and backs saw Sale take a real hold of the game and cement the advantage in their favour, thanks to the hard work of Ryan Parkinson who was able to offload after being tackled to Captain Ben Simpson who went in under the posts. The extras were added by Matt Simpson giving the home side a 7-3 lead. At the restart Hoppers looked to get back in the game with a clever kick that they contested, Sale were fully aware of their opponent’s tactics and cleared their lines efficiently thanks in part to Matt Simpson’s kicking, following on from this kick it seemed to only spur the visitors on leading to Roxby putting Sale on the back foot, thanks to an excellent kick that left us inside our own 22m zone. 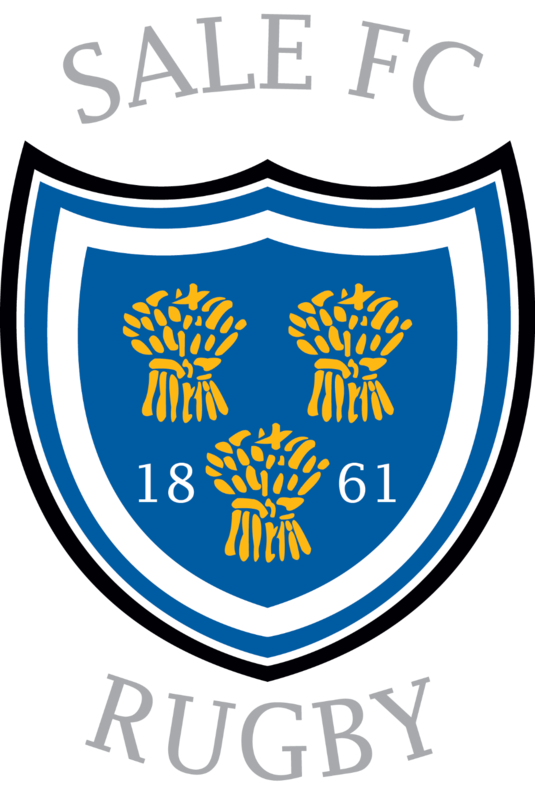 From the lineout, Sale moved the ball once again before losing it at the breakdown, as Hoppers set off on their next attack, Sale fell foul of the referee who awarded Hoppers a penalty for a high tackle, that put Sale back on the defensive side of things deep in the 22m zone once more. Hoppers unfortunately couldn’t add to this advantageous lineout possession and squandered this chance as Sale moved the ball wide with ease due to the poor defence, creating a chance for a 1 on 1 with the opposition winger who dealt with the Sale threat turning the ball over and getting the ball away from the contact area. The game stopped here for a short period as Sale’s No.9 Jack Pellow went off with a damaged finger that required hospital treatment for his injury. From the restart, Sale gained a scrum that saw No.8 Parkinson run hard at the Hoppers defenders, breaking a number of tackles before offloading to debutant winger Alex Miyambo, who added to Parkinson’s efforts creating havoc in the Hoppers defence, after a series of phases prop Joe Kelly registered the first of his two tries, crashing over unattended on the Hoppers line. With Sale now doubling their lead to 14-3, they never really took their foot off the gas for the next 10 minutes adding further scores in the 12thand 13thminutes via debutant replacement prop Tyler Lovett, who latched on to a great pass from Matt Simpson once Simpson had replaced Pellow in the scrum half position, he burrowed his way through the final line of Hoppers defence to score a fabulous team try under the posts. With Callum Ramsey adding the extras Sale took a commanding lead of 21-3, as mentioned the home side added another try in the 13ththrough their now injury free Parkinson who went over after some excellent work in the build-up play, the extras were missed by Matt Simpson due to the difficult kick from out wide thanks in part to the wind, but the lead was now 26-3 over our visitors. Sale at this point, seemed to go up another gear in the subsequent exchanges, as they used their forward pack that included Witness Mandizha, Andrew Edwards-Bailey, Ollie Longmore and the equally effective Colts players from last season John Norton and Josh Boland to great effect creating a number chances as the looked to add to their healthy lead. It wasn’t until the 28thminute that the scoreboard was added to by the home side, as both sides went in search of their next points, this in part to both excellent defence and attack, as both sides strung together a large number of phases whilst heading towards each other’s goal lines in equal measures. The score for Sale came from a well worked lineout from Josh Boland, who ably got the forwards moving on the front foot, after the ball was interchanged with the backs Parkinson added to his earlier effort, Callum Ramsey added the extras and Sale went further ahead with a 30 point lead as we headed into half time. It was the visitors who ended the half on a high though, as they neatly worked the ball up the field to allow No.10 Alex Jobson to go in under the posts, after a great passage of play from the Hoppers players engineered by their scrum half Roxby who added the extras on the stroke of half time, giving us a half time score of Sale 33 Preston 10. After the half time break, it was the visitors who seemed to get out the blocks the quickest, as they earned themselves a penalty due to a Sale infringement at the breakdown. Following the lineout, Hoppers regained possession pushing the ball wide early as they headed up in to the Sale half of the field, unfortunately for the visitors this attack ended prematurely as strong defence from Sale forced them to commit a knock on giving the ball back to the home side. The next few passages during the following 10 minutes of play seemed scrappy, as neither side could keep hold of possession as they committed unforced errors across the field of play. Thankfully, for all watching this period of scrappy interplay came to an end, with our visitors topping up their account after Roxby, Jobson and the opposition backs presented a cross field kick for full back Jake Pass to take over the line in the corner, Roxby here couldn’t add the extras and it was now an 18 point margin for Sale to hold on to. This however seemed to spur Sale in to life, setting up a large number of chances as the forwards and backs ran the hard lines going into the last quarter of the game, Sale were unlucky though as Hoppers defence grew seemingly stronger, preventing the home side from scoring even though they were only 10m away from the visitor’s line on a number of occasions, add to this the fact Sale gave away countless penalties for holding on and high tackles and you could share their frustrations. With the clock showing 15 minutes to go, Callum Ramsey cleverly put Sale deep into the Hoppers 22m zone off a Hoppers penalty for holding on. Here Sale won the lineout just 10m out, setting up a maul in the process before Mandizha and Edwards-Bailey ran hard at the Hoppers line, Edwards-Bailey who had been held up short of the line offloaded the ball to Joe Kelly, who like Parkinson had got himself a 2ndtry of the afternoon, Ramsey added the extras and Sale went into an unassailable lead of 40-15. The home side weren’t done just yet as they closed the game off with another score just five minutes before the end, after their backs and forwards charged up the field enabling one of last season’s colts team Ramsey to dot down in the corner, he added the extras from his own score leaving Sale ending the game 47-15 winners. Post-match Captain Ben Simpson said “I am proud of the side today as we really dug in considering the fact that the 1’s didn’t have their full quota of Jets available to them, meaning that we were missing a few of our number. However, we really gave a good account of ourselves and it looks good for the rest of the season, especially because we have the likes of Tyler (Lovett) and Alex (Miyambo) joining the club, creating those opportunities for #OneSaleFC”. Sale: M Hughes, Peters, White, M Simpson, A Miyambo, Ramsey, Pellow, Parkinson, Edwards-Bailey, B Simpson ©, Mandizha, Boland, Kelly, Longmore, Norton. Reps: Lovett, Hoye, Blanchard Snr. Preston Grasshoppers: Pass, Fearn, Ackrigg, Geatches, Jenkins, Jobson, Roxby, Sloane, Harrison, Edwards, Norrington, Naylor, Burns, Johnson, Wilkinson. Reps: Holden, McGuinness, Goodier.